Am I the only one that thinks February went by in a blur? It's the last day of the month and that means time to draw our challenge winner!!! Random.org chose #33 ! That means Sally McD of Stamping by SAM you are our winner! Please email lora at onecrazystamper dot com to claim your Kraftin Kimmie prize pack!!! Check back tomorrow for a new challenge and new prize!! 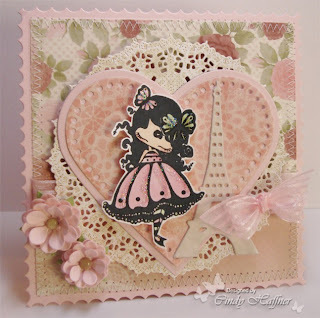 Terrific Tuesday is here again at One Crazy Stamper, and this is my last card for this month's "Love is in the Air" challenge. This week I finally got to color an image from a stamp company I had never bought from before. 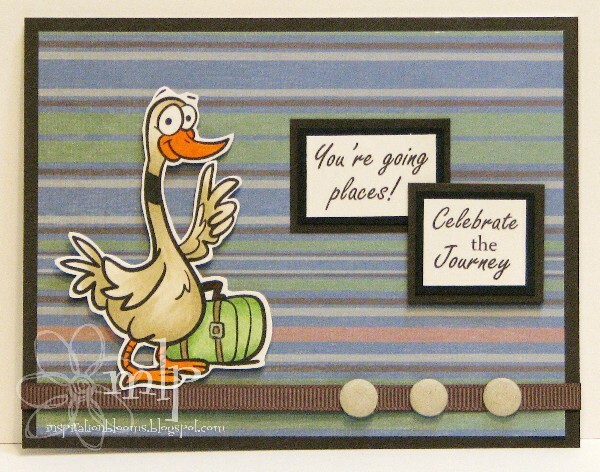 This is "You and Me Boy" from Morehead Stamps, one of the newest companies that Lora has brought into the store. The image was stamped with Memento Tuxedo Black ink onto Copic Xpress It cardstock, then colored with Copics and Prismacolor pencils blended out with Gamsol. I used the Copic Colorless Blender Pen to give his shirt a plaid pattern, which is an easy but very effective technique - just color the shirt as you normally would, then use the Colorless Blender pen to remove the color to make the lines. The Colorless Blender pen is not for blending as you can easily see, but instead is Copics answer to the eraser. The image was cut with Spellbinders Label 21, the sentiment is an oldie from Waltzingmouse, and jute string was wrapped around the front to finish the card. Today is the last day to enter the challenge to win the monthly prize, so finish up that last minute project and enter!! Happy Monday! 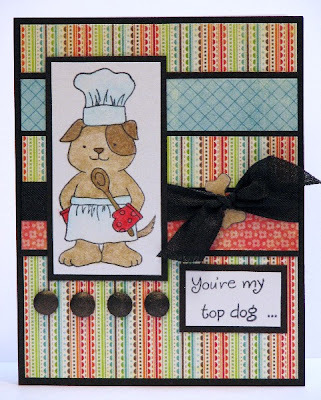 Today for One Crazy Stamper I'm sharing some Inky Antics stamps and HoneyPop goodness! This set is called Baking Pup. I colored my image with PrismaColor Pencils and Gamsol for a soft and mellow look. I paired the images up with My Mind's Eye designer paper, seam binding and some Candi. The surprise comes when you open the card and a fun honeypop element opens! In this case, an adorable puppy treat! I added some colorful papers to the inside of my card and did some fussy cutting...but if that is not your thing, they are adorable when you just stamp them on the inside of the card as well. Have you tried out HoneyPop papers?! 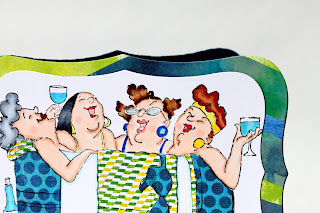 They are much fun....I'll be sharing more samples and a tutorial with you soon! my last post for this month's theme "Love is in the Air". 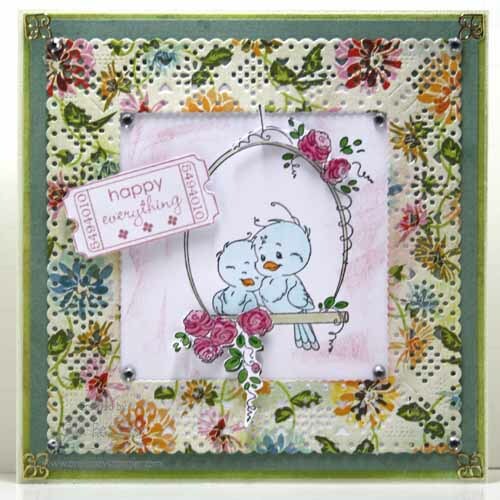 I have used this adorable stamp from the Whimsy Wee Stamps called Bird Swing. There is still time to enter this month's challenge which is "Love Is In the Air" and Thursday is the start of a new challenge. All supplies can be found at Lora's amazing store One Crazy Stamper. Well I have had some major technical problems this week! Monday my laptop slipped off my desk and I did catch it before it full hit the ground BUT it jarred the hard drive and created a disk error. It now takes 45 minutes to turn my computer on and load windows. As a blogger I use my computer a lot, as a student it is like an extra arm so we tried everything to save it and it went bye-bye! So Wednesday night we went to purchase a new laptop hopefully one that will last longer then 11 months unlike the last one. This is my 3rd laptop purchase in 4 years. So we made it count and I got a beauty of a laptop. It is top of the line and pretty much is one of the best out there. Of course with my clumsiness my hubby was sure to purchase one of those accident protection plans and he got the max so I am covered for 3 years if I drop it, break it, crack the screen, and pretty much everything else I can possibly do to the thing. An example of how cursed I am with electronics is a few years ago I was holding my MP3 player and I touched metal. Well, I had so much static electricity built up that the shock actually surged my MP3 player and fried it. So the reason for this long winded story is why my picture is not watermarked because for the past 2 days we have been slooooowwwwlllllyyyyy getting data off of my old laptop and putting it on our external hard drive. I have a 50th surprise party to go to in a few weeks and I thought this Fight Like a Girl A La Mode by My Favorite Things would make a FUN birthday card. I used my snap together alphabet to create the saying. I also used the large circle and large scalloped circle nesties. I also used sew easy floss for the button. Our Challenge this month at One Crazy Stamper is Love. Yes, and I love to be able to play golf in February in New England. I played nine holes on Wednesday and it was fabulous to be out there swinging the golf club. 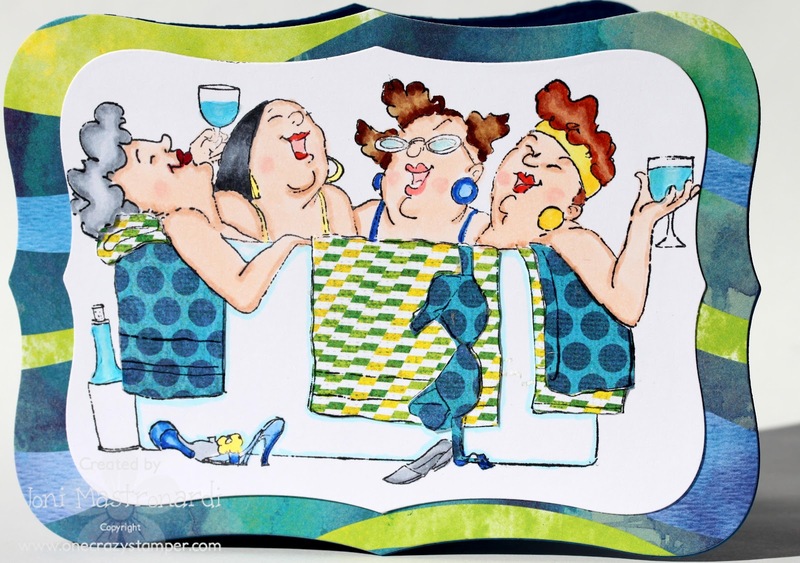 Love this new stamp from Art Impressions: Golden Oldies available at One Crazy Stamper. 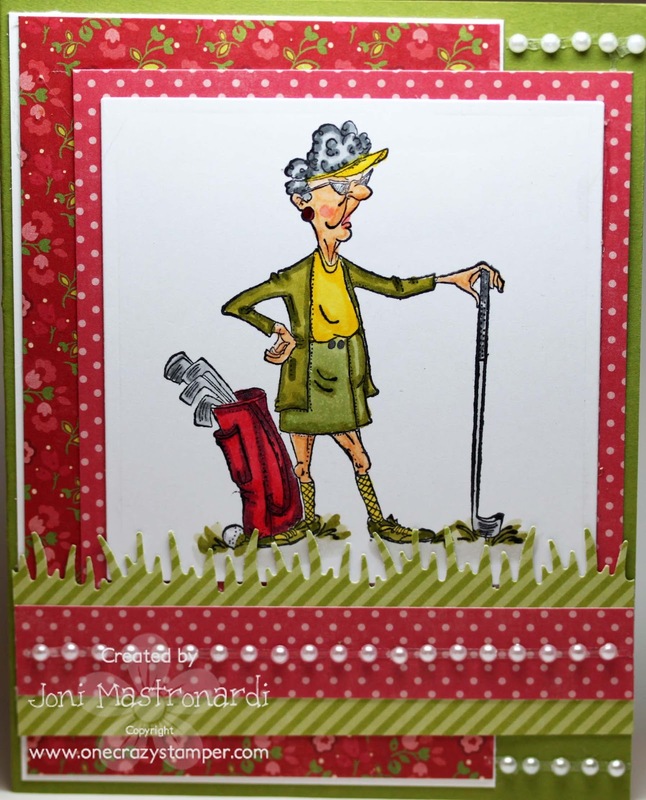 I stamped my golfing lady with Memento Tuxedo black ink unto Xpress It cardstock. Then I colored this lady with the copics pictured below. I created the grass with a Martha Stewart border punch. I added some pearls (let's pretend they're golf balls) for embellishments. I’m mixing it up today on the OCS blog to show you a crafty project I recently completed. Ever since I saw a cluster of the alphabet in Pottery Barn’s magazine I’ve wanted to do my own version. Fast forward a couple of years and I finally got around to doing this project. We recently rearranged bedrooms in our house so this left me freshly painted walls to decorate. After I collected all the letters, I was ready to start! I had to dig through my stash and find some really fun printed papers. Most of these happen to be October Afternoon papers…one of my favorite paper companies! I used Modge Podge to adhere the paper to the letter. I painted the rest of the letters and made a few of them special. The “Z” is chalk board paint and the “R” has Viva Decor Pearls on it. I really like the way this project turned out and the kids love it too. My mini 2 year old munchkin points and starts singing the alphabet when she sees this. Have you recently finished a project that you love? I’d love to hear about it. Hi all, Madge here for another Wonderful Wednesday! All is well on the home front – my little Michou has rallied around and is back to normal. Thank you to all who the emailed me of concern. Everyone who knows me personally, know how much I love that little furry cuddle-bug. I’ve chosen to do a “stampless” card today. [ Oops, I lied – there are two stamps used on it – one for the inside and one for the back.] When I noticed that OCS was carrying the Marianne dies, I was over the moon! So today I’m showcasing a Marianne Creatable die called, Elegant Lady , along with Spellbinders oval and scalloped oval die. I started with the die cut and made it into a cameo by placing it onto a white oval (added color to the cut out) and matted it with a black scalloped oval, to which I added pearls made with my Ice White Viva Decor pen. The die is so elegant, that I thought I would make it look like a picture covered with glass – so I used Ranger Glossy Accents to cover the cameo. “Gorrjussss”!!! Looks like a little framed picture. 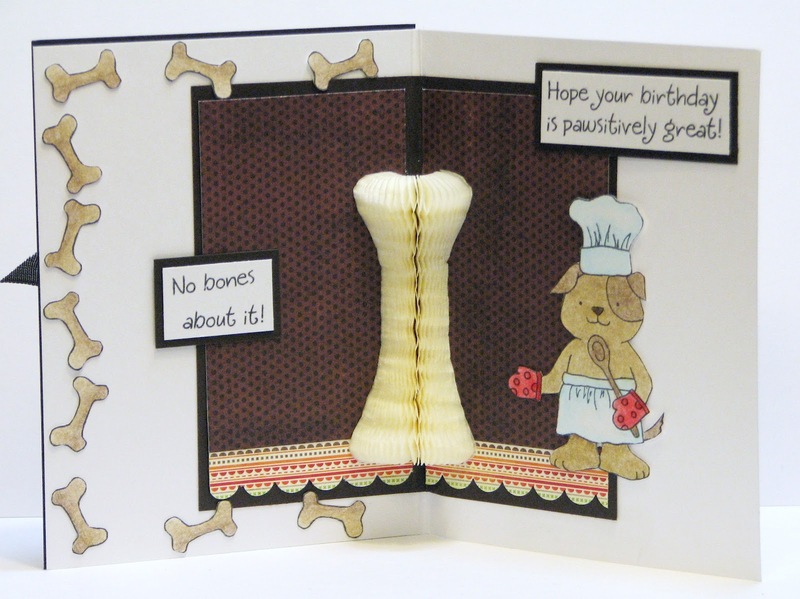 I LUV making different folds for cards – this one is a vertical flap over a regular ( 41/4" x 11" - scored in half) card base, which allows me to leave a private message, but also allows the card to be displayed in an upright position. With all the beautiful die cut borders and border punches available at OCS, I chose a MS border punch b/c I had it handy on my crafting desk. I used Broken China TH distress ink to distress the edges and added some flowers and a trendy, large Organza Ribbon Bow. The flowers are from here, and here. The flap is held in place with a little black photo tab and brad (from stash). Here is a look at the inside flap of the card. One Crazy Stamper's Terrific Tuesday is upon us again - it's my turn to show you some of the wonderful items available both online and at the store. 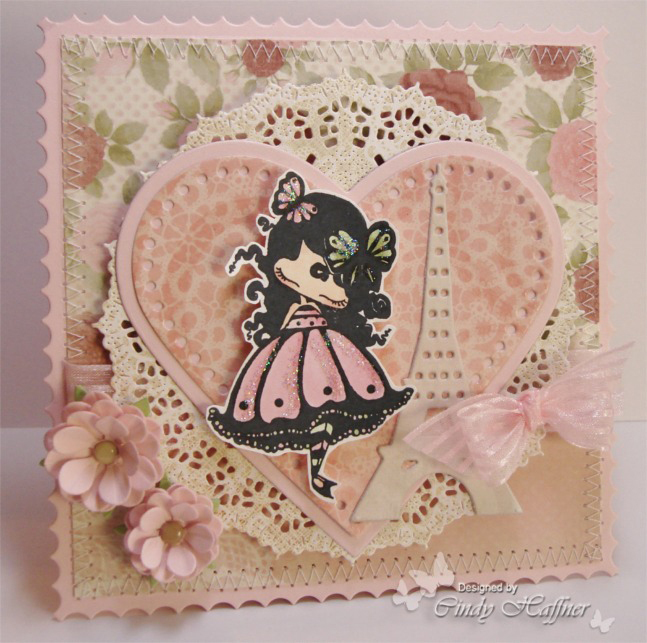 Here's Kissy by Mo Manning for Stamping Bella!!!!! Doesn't she look just like the typical Prima dona waiting for her accolades!! 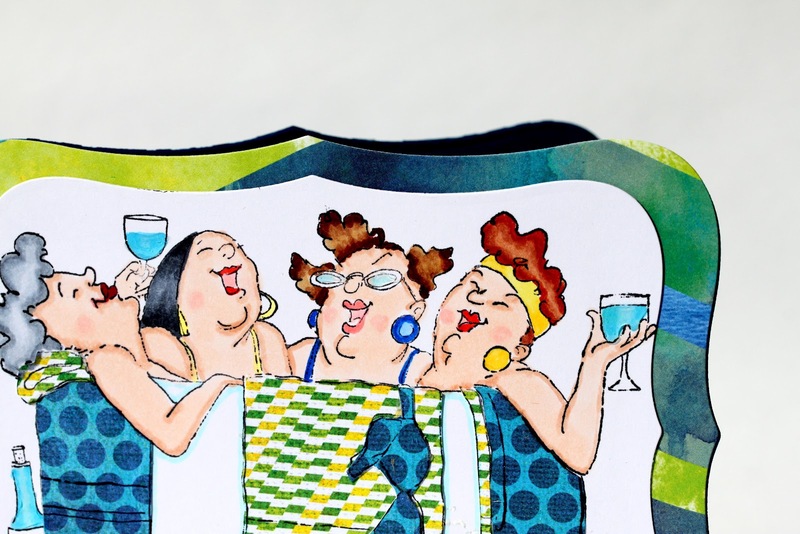 The image was stamped with Tsukineko Memento Tuxedo Black ink on Copic Xpress It paper. I colored her with Copic sketch markers and Prismacolor pencils, then highlighted the rubies in her crown, on her slippers and around the sentiment with Stickles Christmas Red. Although you can't see it on the photo her sash and crown shimmer with the addition of Sakura's Stardust pen. The dp, frame and seam binding were distressed with Tim Holtz's Vintage Photo Distress Ink. The designer paper is from the Pretty in Pink collection from Glitz, the flower is from Prima, and the frame is from Spellbinders ( it's an oldie but goodie ). Hi all, it is Sue here for another Sunday post. The cards have certainly been awesome this week. I couldn't resist using this cute Snips and Snails stamp by Cheryl Alger for Kraftin' Kimmie. There is still time to enter this month's challenge which is "Love is in the Air". 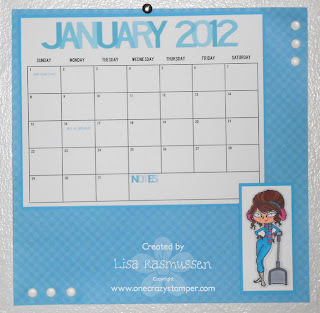 Check Lora's store One Crazy Stamper for some amazing deals. It seems like every week gets busier and busier and I wish I could add a few more hours each day just to stamp! I see soooo many cute ideas out there but there is just not too much extra time! I had a little bit of time today to play and I had to pull out some fun, bright colors! I love this My Favorite Things A La Mode Talk Nerdy to Me! It can be used for soooo many different occasions and I love when I can use a single stamp for different purposes! These stamps are also soooo much fun to color! I love this new image from:Inky Antics- Wordly Women Set #3 available at One Crazy Stamper. I stamped my focal image with Memento Tuxedo black ink unto Xpress It Card stock. I cut her out with Spellbinders Label 8 die. I added some swirly pearls. 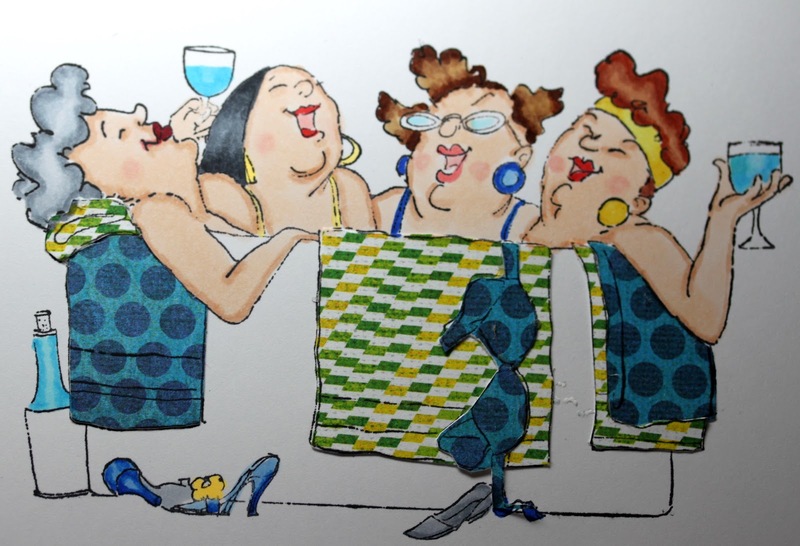 Hi all, Madge here for a wonderful Wednesday – following Shari’s Terrific Tuesday card (which was really terrific). I’m a little distressed today as I had a rough night last night with my little Michou (13-yr old Shih Tzu / Poodle cross). He was having some problems and needed out every half hour all through the night. Needless to say, I kept a close eye on him all day – which makes me very cranky. Worse than having a sick child – at least a child will point to where they are hurting. We will have to keep an eye on him for a couple of days to see if it continues – which will probably mean X-rays / blood tests / etc. etc. if he doesn’t improve. He’s been my best little bud for 13 yrs – used to sit under my desk at work :) He was great at being the official greeter at the office. Anyway my card will be simple – with the explanation to follow. Technique: Paper Tearing & Z-fold card. Supplies: Bo bunny papers, gold seed beads (for sand) Tombow glue (to attach beads); twine , crackle accents to strengthen the anchor cut from c/s, Copic Markers; X-press It Blend c/s; Pearl Pen (Ice White)) (for seashells); Can anyone guess what i used for the lettering and the sea shells?? . . . . . . . . split pea soup mix . . . . . kinda fun poking through a whole package to find the correct letters!! My 110 Copic Marker was used to highlight them. I also drew on the paper to give the illusion of a pirate’s map. Well, that’s it for this week. Hope your significant other treated you well for Valentine’s Day. I know mine did! (unbeknownst to him . . . lol). Happy Valentines Day everybody, I hope that you are all spending the day with your special someone!! It's Terrific Tuesday here at One Crazy Stamper which means it's my turn to shine, so without further ado, may I present the fabulous Bling Baby from Whimsy Stamps Kenny K collection!!!! This sassy little lady was stamped with Memento ink onto Xpress It paper, then colored with Copics. Labels 14 from Spellbinders was used to cut the image out, then the edges were inked with a Brilliance Starlight Silver Dew Drop ink pad, and mounted on metallic silver paper. 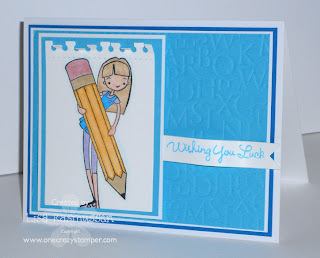 The front of the card was made by stamping Street Art from Whimsy Stamps Backgrounds collection with Versa Mark. and embossing with white embossing powder. To give the card and sentiment a silver glow I used Delta Sheer Silver Glaze over both ( the things you find when looking for something else in your stash!!!! ). 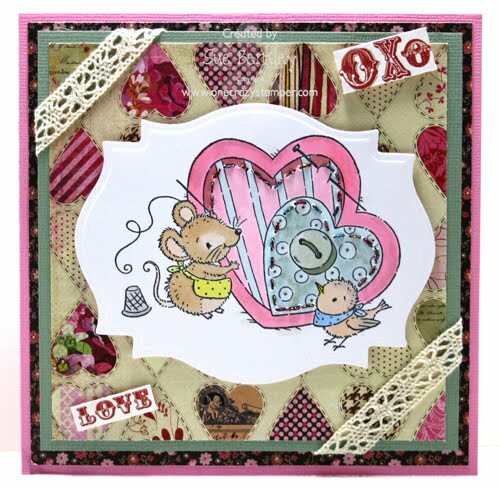 The sentiment is from Whimsy Stamps Film Strip Sentiments and there is a matching die to cut it out. The edge of the card has a punched border of hearts cut from silver metallic paper using a Martha Stewart punch. The theme this month here at OCS is LOVE IS IN THE AIR and you still have two weeks to enter the challenge for your chance to win, so check out the rest of this blog and the creative talents of the design team members, then get creative and enter!! This is one of two posts today...so be sure to scroll for more inspiration! This post for One Crazy Stamper features the Celebrate the Journey set by Your Next Stamp. 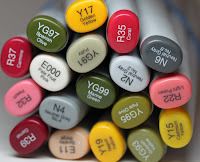 I colored the image with the following Copic Markers: E47, E44, E43, E42, YG63, YG61, YR16, YR04. I fussy cut the image and popped it up on foam tape. It is certainly looking like winter here, as it is snowy and cold. For my image today, I have used this cute stamp called Stitched Hearts designed by Tina Wenke for Stampavie; as well as a product review. Now for a review of this amazing product -- Magnetic Storage Folders. Lora has two types; one by Marianne Designs and the other by Joy Crafts which is pictured below and unfortunately, it is currently out of stock at the moment. Hopefully, Lora will get some more in stock as we are all anxiously awaiting the anticipated arrival the new Spellbinders Pre-orders. These items are awesome as you can store between 9 - 10 Spellbinder die sets in each one. Whats more, you can see at a glance your different die sets and decide which one to use without opening many many packages. Do join us in for our February Challenge at OCS which is “Love is in the Air”. Love to see what you create and gives us a way to drop in on your blog to visit. 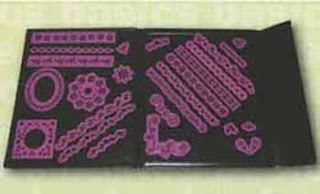 While you are at it do check out Lora's store One Crazy Stamper for some amazing and new craft items. It feels like forever since I have posted! I am keeping this a little short because there wasn't much to this project! I ended up giving away the first January Page I did and I made another one for myself. Although I don't have very many pictures for January so I need to get better at taking photos! 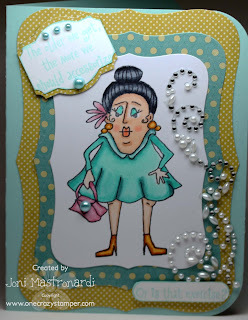 I used the adorable Kraftin Kimmie Stamp Eva. She is sooooo much fun to color and was a had to have once I saw her on the One Crazy Stamper Store site! She is just so SASSY! 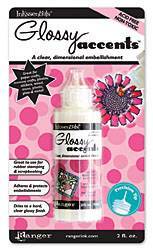 Today I have a product spotlight for you. 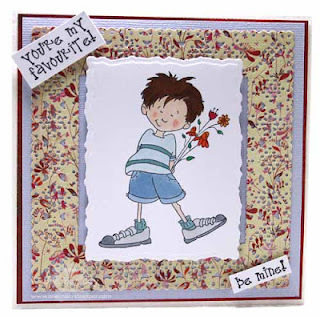 For this image I used the adorable Art Impressions Girlfriends stamp. I stamped my image with Memento Tuxedo black ink unto Xpress It card stock. Here are some pictures with glossy accents added to the glasses and bottle. Notice the shimmer. Hi all for another wonderful Wednesday – looks like a Frosty Friday outside here in the Okanagan Valley. We’ve this spectacular thick frost coating all the tree branches and when the sun hits it it is absolutely amazing. Today I’ve chosen another Magnolia stamp called Tilda with Candy Cone – available at OCS. I’ve had this image colored for a while – but hadn’t gotten an idea of what I wanted to do with her. I was poking through some DSP’s and found a piece of SU, that seemed to fit in perfectly. I have one of the most wonderful SU demo’s and we had just done a couple of unique folded cards – this is not one of them, but the other cards gave me an idea of something that could be done differently. It is a card within a card. Materials used: Magnolia Stamp – Tilda with Candy Cone; Xpress It blend c/s; Copic Markers; Memento Tuxedo black ink; Doohicky border dies; Shrinky Dink (hearts); Marianne Creatable die; White pearl hearts (died red with Copic marker). Mi sc. C/S from stash. Hope you will join us in the Feb. Challenge at OCS which is “Love is in the Air”. Love to see what you create and gives us a way to drop in on your blog to visit. This gorgeous tag/card was created by our February Guest Designer Jennifer Roach. 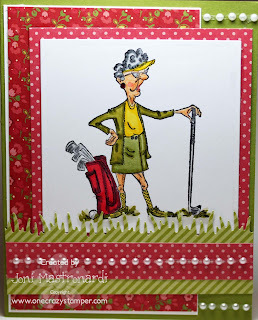 We are so thrilled to be able to showcase Jennifer’s talent here on the OCS blog. She has colored this stamp so beautifully! If you haven’t seen Jennifer’s blog please hop over to take a look! Thank you Jennifer for joining us this month and for being a friend of One Crazy Stamper! 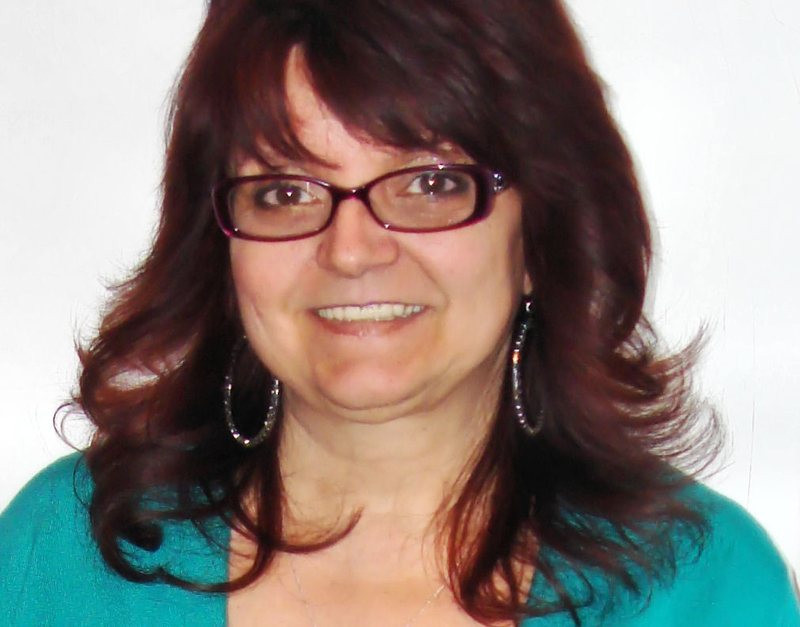 Today I have the pleasure of introducing you to Cindy Haffner! I have been a long time fan of her blog. Not only is she super talented but she is one sweet gal! Here is the card she created for us to feature here on the OCS blog. The soft colors of this card are so pretty! Here are the detail of supplies used on her card. If you haven't seen Cindy's blog, you should hop over there now for some serious eye candy! Thanks for joining us this month Cindy! The word I chose for myself for 2012 is WRITE. I believe the idea for the word of the year originated from Ali Edwards blog? Did you choose a word for 2012? I have so many things I want to write. Funny stories about my kids, childhood memories, and stories I’ve made up. And I love this image from MFT. I made this card for my daughter’s teacher for Valentine’s Day. The papers are from October Afternoon. Howdy Partners! How sweet is this image from My Favorite Things? Perfect for my little guys Valentine’s Day card! My papers are Bo Bunny and I used my Nestabilities quite a bit to cut out my circles and stars! I’m keeping my post short and sweet today because we have a fun day planned with the kiddies today. How about you what are your weekend plans? I’m gonna be honest, I’m not really a cat person. 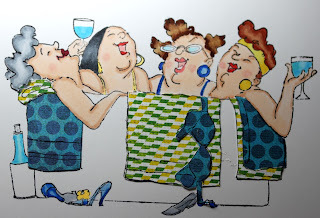 But who wouldn’t love this sweet Belles N Whistles image. I know a little girl who loves kitty’s and this image is just perfect for her. So this is her Valentine’s Day card from me :) I had fun coloring her up with my copics and adding this fun border with my Viva Decor Pens. My papers are from My Mind’s Eye. So, what I want to know is… are you more of a cat person or a dog person? February OCS Challenge "Love is in the air"